The unpredictability of Alzheimer’s makes an already difficult disease even harder to manage. It’s hard to prepare emotionally, physically and financially when you don’t truly know what to expect. 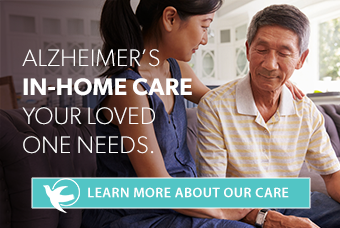 Every day is different, every person with Alzheimer’s presents differently, and no two caregiver journeys are alike. If you have a loved one who has recently been diagnosed with Alzheimer's, it's essential to have a firm grasp of what's to come. Because when this person's needs eventually evolve – what will you do? Because no experience is the same, there's no What to Expect When You’re Expecting equivalent for Alzheimer’s (though the classic by Nancy L. Mace and Peter V. Rabins, The 36-Hour Day, is an excellent resource). But it’s hard to go about each day without knowing what’s coming, what’s normal and what’s cause for concern or further investigation. There’s not even a concrete answer about the disease’s duration: A person can typically live with Alzheimer’s for four to eight years following diagnosis, but some can live up to 20 years after, says the Alzheimer’s Association. Recently, CBS News shared another emotionally powerful installment of a story they’ve been following for a decade now, the story of a couple affected by Alzheimer’s. Husband Mike Daly has been caring for his wife, Carol, since her diagnosis in 2008. Carol is currently in the final stages of the disease. You can watch the video here and read highlights of previous year’s interviews here. As you walk through the challenging stages and symptoms of Alzheimer’s with a loved one, drawing on the support and experiences of others can lighten the load and ease the fears and concerns that accompany them. That’s why Day recommends family caregivers join a support group. “Having a group of experts in your circle is invaluable,” she adds. Because it’s hard to pinpoint dementia, many people aren't diagnosed until they're further along in the disease — so you may find your loved one moving more quickly through the middle stage and into later-stage symptoms faster than you anticipated. But don’t lose hope: There are many hidden joys amidst the pain of dementia’s unstable nature. Because it’s not always a slow and steady decline but often a roller coaster of extreme ups and downs, you may have days, minutes, or hours of clear language, confirmed remembrances or glimpses of your loved one’s “original” personality shining through. Take those clear moments as the gifts they are, and hold on to them for the days when your worlds are turned upside down by dementia. Also, be careful not to compare. While it helps to share stories with support group members and swap experiences with friends or family who have witnessed the progression of Alzheimer’s, you can’t expect your loved one to move through the stages identically. Also, know that reaching out for help from a professional caregiver does not mean you are incapable of doing care, or that you’re not already doing enough. As the disease advances, the symptoms become harder to manage, and if your loved one lingers in a stage for many years before reaching the next, endurance is key. In this article, family caregiver Marty Schreiber talks about the feelings of guilt he experienced when he decided to bring in-home care to support his caregiving for his wife. Not sure if a loved one has dementia or Alzheimer's? If you suspect memory loss, and it's beginning to interfere with daily life, click here to read about the full diagnostic process and why it’s so important. What kind of support and day-to-day help would a professional caregiver provide? This article on Dementia Care: Insight into Care and Symptoms outlines the type of tasks a professional caregiver could offer assistance with based on the varying stages of dementia and Alzheimer's.